I have a big problem - hopefully somebody can help me! I have a home-made sailboat (45f), built in 1989. I never had insurance for my boat and a survey was never done. Now I want to haul my boat for at least one month and I need liability insurance. . (Years ago I could haul my boat without any insurance) The marina in Fort Pierce I chose won't haul me without liability insurance. Does anybody know an insurance company that will give me liability insurance without a survey including the hull? I really appreciate any answer!!! I have more questions than suggestions, but please bear with me. I'm assuming you don't have household insurance. Secondly, we've had haulouts for a survey, and it was usually a quick out on the slings, surveyor looks, splash back in, 1/2 hour or 1 hour at the most, at a nominal fee. Your yard won't give you such a haulout? Third: for liability insurance only, what reasons do the insurance companies give for requiring a hull survey? Chance that the boat will sink at the dock? Just curious. I can't say with any authority, but I wonder if your not having any insurance all this time is part of the companies' hesitancy - with no track record, you're an unknown risk. How about other haulout and storage yards. do they all require liability insurance nowadays? Which came first the chicken, or the egg kind of catch 22 situation here. I think it is possible to get hauled in the Bahamas with no insurance, and there are surveyors there. I have been warned in several yards to show proof of insurance, or no haul out. The age, and construction may be the problem for you? My boat is cold molded, and that for some reason scares the heck out of insurers, and yards. Although every yard I go to , and surveyor I have used. They all claim it is the strongest catamaran they have ever seen. They are insurance brokers and have arranged insurance for my boat for the past 2 years and did not require a survey. Your case is a little different as I understand you are looking for temporary coverage. Anyway it might be worth a try. 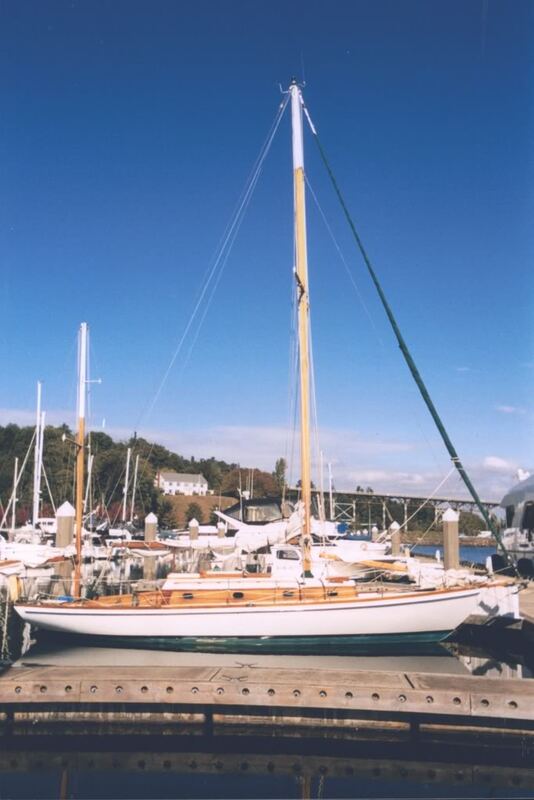 We recently (18 months ago) purchased and hauled out our 54 ft wooden boat (built in 1931 and last surveyed in 2001) which is undergoing major rebuild. The boat was uninsured when the haulout took place though we could have gotten it. We were very concerned about our liability and investigated insurance. We discovered insurance for the haulout would have cost us $600 (for that single haul-out) through a local boat insurance broker. We talked with the very reputable yard doing the haulout and the trucking (boat mover) company taking the boat to another yard where work would be done about this need for this insurance. They both said we didn't need insurance. We did not purchase the insurance mainly because the boat would be towed to the yard from the marina by SeaTow without the owners onboard, limiting our liability while still in the water and the boat's engine had been removed already and the fuel tanks as well. Risks seemed small and the haulout yard waived their normal requirement for insurance based on our in-the-water pre-purchase survey of the boat. They also waived the requirement for a "disposal deposit" which they normally require for really old boats or boats in really bad shape. We learned that the haulout yard only was concerned about us having resources to enable disposal of the boat if it "fell apart" because of low structural integrity (sometimes happens with old un-surveyed wooden boats but our boat had an in-the-water survey that indicated adequate integrity for both the haulout and a trucked move. Bottom line--you can have an in-the-water survey which can usually get insurance for you if needed. The in-the-water survey will usually require an out f the water survey within a short time (like while you're hauled out). You can also do as another poster suggested and have the boat surveyed while in the sling. Liability insurance is a good thing and hopefully you'll be able to get it after a survey with this haulout. If it is a wooden boat, you may have to provide a disposal deposit simply to get the boat hauled even if you are insured. That is because so very many people do not maintain the structural integrity of their wooden boats. If it's not wood, I suppose fuel spill risk is also a reason they'd want you to have insurance--and a reason you'd want it yourself. I had a similar problem with a boat I bought recently, which was in no way ready for a survey. I wanted to put it in the water at a marina, but the marina required $500,000 liability insurance. I talked to my homeowner/renter insurance provider, and they included the boat under that policy and faxed a letter to the marina saying I was covered. The marina accepted that. In fact, the homeowner's policy even covers damage to the boat, up to some small amount. It depends on the size of the boat if a home owners or general liability (umbrella) policy will cover and what they'll cover. Our umbrella liability policy (a.k.a. "excess liability" policy) through our home owners' (Fireman's Fund) will cover boats we own but the boats must be under something like 45 feet (our boat is 54' on deck) and must have basic boat liability insurance for 300K before the "excess liability" insurance of 2 million kicks in. Covers our smaller boat, but not our cruising boat. And, requires that initial insurance policy on all boats and cars. 300K on boats, 500K on cars. All home owners policies we've ever had I think have had a similar requirement for all cars and boats to have a 250-500K policy written on them before the home owners kicks in to pay for anything. The person making the original inquiry can probably get a BoatUS policy with a survey of the boat in the water and follow up in the yard. Considering the risk for spill and environmental cleanup, etc, I don't see how any boater manages to make do without insurance. I was faced with this same issue on a 46 yr old boat recently. I was able to get Liability without a survey from Progressive with limits of 100/300/100 for under $400 per annum. A home built boat of the size he's talking about is probably wood, steel, or ferro-cement not fiberglass or Aluminum. I didn't see mention of material of construction in the original post. Well, anyway, Progressive doesn't insure wood or ferro-cement hulls. They do insure fiberglass and aluminum. I think they don't even insure steel hulls but I don't know that for sure. Mine is a woodie with C-Flex overlay so yes, they do insure wood. I saw your prior posting and realized I'd not talked to them about insurance for either our fiberglass or wood boat. Called them, asked them about their boat insurance for sailboats. We didn't even get into sizes of boats, ages, etc because the first thing the fellow said was that their underwriters will currently offer insurance of up to $250K (boat value) for fiberglass and aluminum boats. no wood, no steel, no ferro-cement. I was looking for a company who could insure both boats, not just one...and one of my boats is wood. this information is current--"now", not in the past, not for previously insured boats, but now, for a "new" policy...don't have any idea of when you may have obtained insurance with them, but you surely know that things change all the time, which is why I posted that this company doesn't insure wood, ferro-cement or steel. I don't have a steel boat, but got the impression that they'd present steel boats for their underwriter to consider and I didn't ask any further. I have no idea what C-Flex overlay is. Is the hull fiberglass and the deck/cabin house wood? That was very common in the early years of fiberglass. Some "fiberglass" boats have lightweight wood core but aren't considered "wood" by the insurers. However, cold-molded and epoxy boats that people home build are considered "wood". May not really matter in the context of this insurance discussion since it seems like this company is pretty risk adverse and though I didn't even ask about "home built" boats, I would suspect they won't insure them. I hope the original poster has found insurance! Thanks. How strange. I just got insurance on her this month. She's carvel planked mahogany over white oak frames. The C-Flex is a fiberglass sheathing system developed by Siemens that a previous owner had applied in 1996 after replanking where needed and refastening. So basically, I have a wood boat in a fiberglass hull. That's really strange. I told the agent I spoke with she was wood and there was nothing said about it. I am not often right, according to my ex., so I may be wrong again but I have a problem with sheathing wooden boats. Wood is a natural material which breathes. It allows moisture to pass through it. Also, when a hull dries the seams open thus, when sheathing a hull one is effectively putting a moisture barrier in place stopping water entering the boat through seams or being absorbed by the wood. In a way, this is what we want. It stops sea water entering the vessel but it must also be a surface for moisture to condense upon on the inside. I wonder therefore, do sheathed wooden boats not suffer from rot due to this? I have no experience of sheathed craft, except for sheathing at and below the waterline to prevent ice damage, so I will be grateful for information on this. Maybe your agent was "nice" and listed you as a fiberglass hull. "technically" you are, I suppose. It would be interesting to know but you probably have no way of finding out without risking your insurance.